Swiss Air Lines cheap non-stop flights Zurich to Bangkok just €436 return! SkyTeam member China Airlines offer affordable non-stop flights from Amsterdam to Taipei already for €447 including all taxes and fees as well as onboard meals and checked luggage. At this moment limited availability in first half of 2019. If you appreciate reasonably priced direct service rather than the cheapest solution available this is fair deal. (otherwise look for flights based on Xiamen Airlines which is currently the cheapest option on this route. Bookiing sample below). China Airlines discounted direct service between Amsterdam and Taipei is available when traveling from 18th of February to 29th of March or 10th of May to 19th of June 2019. Based on date of your outbound flight from the Netherlands to Asia. Need affordable hotel in Taiwan you can book your accommodation via Booking.com or Hotels.com. 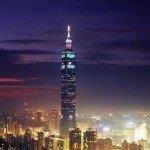 Booking sample of cheap non-stop flights from Amsterdam to Taipei, Taiwan from €447! As per our above link you would depart from the Netherlands to Taipei on 23rd of February. Inbound from Asia back to Amsterdam (direct service) on 2nd of March 2019.